MAIN DESCRIPTION Situated at the meeting points of Dunscroft, Dunsville and Hatfield, this surprising house is ideally located for local shops and both primary and secondary schools. With easy access to the M18, M180 and wider motorway network, as well as nearby Hatfield & Stainforth railway station, it’s a great location for families and commuters alike. With generous gardens, off-street parking and a huge amount of scope for modernising and extending, subject to the necessary permissions, this three-bedroom, semi-detached property is the perfect purchase for investors and those with an eye for a terrific family home. ENTRANCE HALL With a uPVC front door that’s half-glazed with stained glass, the entrance hall has a door on the right which leads to the dining room and living areas, and the stairs go straight up to the first floor. DINING ROOM 12′ 5" x 10′ 2" (3.8m x 3.1m) Currently labelled as the dining room, this is a great flexible space that could be put to several other uses. Reached from the entrance hall and with another door that leads through to the kitchen, it would also make a cosy living room. There’s a central ceiling light, radiator and power points, plus a gas fire and a window that overlooks the front garden. KITCHEN 15′ 5" x 6′ 10" (4.7m x 2.1m) The kitchen is a bright, airy space with three windows and the half-glazed door through to the back garden. The wood fronted cupboards and drawers provide a ton of storage space, and the black granite effect counters compliment the grey tile-effect flooring. With plenty of room, power points and potential, there is the opportunity here to update the existing units into something really special. An additional doorway leads through to the living room. LIVING ROOM 15′ 1" x 10′ 5" (4.6m x 3.2m) Currently the only access into the living room is from the kitchen, which does have the benefit of reducing drafts and maximising the wall space for furniture. However, there is the opportunity to open up a doorway to the hall, providing direct access from the front door and maximising the usage opportunities. There’s a central ceiling light and two wall lights, as well as two substantial feature beams across the ceiling. Windows to the front and French doors to the rear provide plenty of natural light, and there’s also a gas fire in a feature fireplace. BEDROOM ONE 15′ 5" x 13′ 1" (4.7m x 4.0m) The master bedroom is a very spacious room, with ample space for a king sized bed and lots of bedroom furniture! It over looks the front of the house, has a radiator, central ceiling light, tv aerial and power points, as well as a built-in cupboard over the stairs. 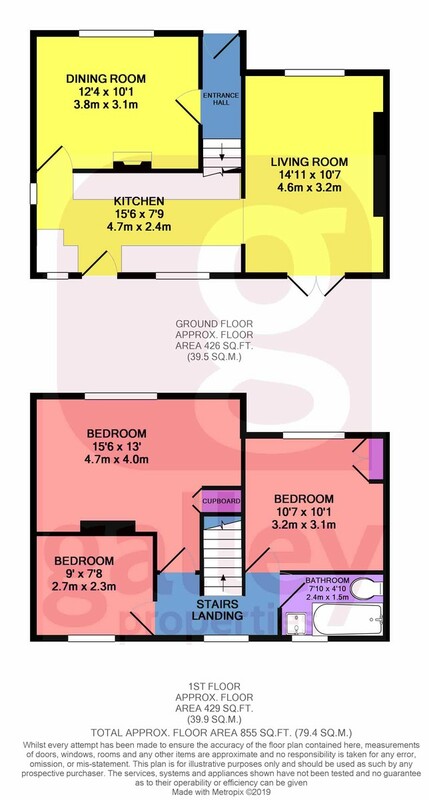 There’s also plenty of space for the addition of an en-suite if so desired. BEDROOM TWO 10′ 5" x 10′ 2" (3.2m x 3.1m) There’s plenty of room for a double bed and furniture in here, as well as a built-in cupboard, radiator and power points. The window overlooks the front garden, and there is currently a line of bookcases along one wall – maybe this room could be the house library! BEDROOM THREE 8′ 10" x 7′ 6" (2.7m x 2.3m) Overlooking the rear garden, the third bedroom has a radiator under the window, central ceiling light and power points. It would also make a really good home office or craft room, with its view out over the garden and the green spaces beyond. BATHROOM 7′ 10" x 4′ 11" (2.4m x 1.5m) The family bathroom currently comprises a white low-level WC with wooden seat, a white bath with wood panelling and a white sink set in a wooden cupboard surround. There’s a window in front of the sink and a radiator on the opposite wall, with tile-effect vinyl flooring. EXTERIOR SPACE FRONT GARDEN The front garden is laid to lawn and surrounded by a low stone wall. There’s a path along the front of the house from the driveway to the front door, and the concrete surfaced driveway goes down the side of the house, through twin wrought iron gates and stops a car’s length beyond the back of the house. This provides ample off street parking for at least three vehicles. REAR GARDEN The generous back garden is in need of some TLC, but has bags of potential to be a really amazing space. There’s a greenhouse and two wooden sheds, an area of two-colour paved patio outside the kitchen door and some lovely mature trees, including a fruit tree and a cordyline palm. There’s also an area that used to be a vegetable garden and a good sized patch of lawn. Whilst we take great care to provide accurate and reliable information, these particulars are intended as a general guide. All measurements are subject to a margin of error. Galley Properties have not tested any of the services, systems or appliances and therefore cannot verify that they are in working order or fit for purpose, (including heating systems). All photographs and floor plans are for guidance purposes only, please note some photographs may have been taken using a wide angle lens. Fixtures and fittings are only included subject to arrangement. Reference made regarding the tenure, (and where applicable lease term) is based on information supplied to Galley Properties and it is strongly recommended that potential buyers seek verification on tenure and lease term as well as all other matters through their own solicitor.